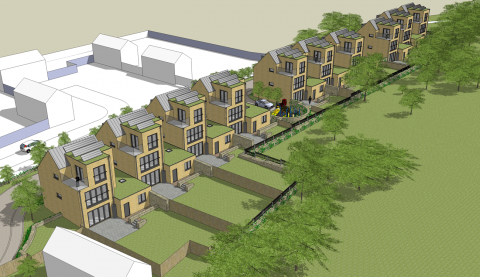 This brownfield project required the sensitive handling of a redundant council depot site on the edge of a conservation area, the Town Park and adjoining listed buildings, to deliver ten sustainable family homes. The design solution sought to combine contemporary forms with traditional materials to meet the complex demands of the local planning authority and neighbours. Features of the houses include a home office, cycle parking for the whole family and roof level balconies affording views across the Town Park. AD Architects had previously surveyed and restored the 16th-century Grade II listed Marshgate Farmhouse for Harlow Council.